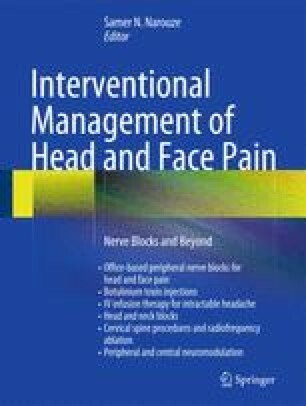 Peripheral nerve blocks (PNBs) are valuable diagnostic and therapeutic tools in the management of headaches and face pain. These nerve blocks include supraorbital nerve, supratrochlear nerve, infraorbital nerve, inferior alveolar nerve, mental nerve, auriculotemporal nerve, glossopharyngeal nerve, and greater auricular nerve. Maxillary nerve, mandibular nerve, and occipital nerve blocks will be discussed in other chapters. These PNBs are simple to perform and usually very safe; however, they can be catastrophic although very rarely. This chapter reviews clinically relevant anatomy, indications of different blocks, description of standard and novel ultrasound-guided techniques, feared complications, and pearls about how to perform these procedures safely and efficiently.